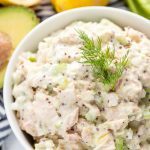 Tuna Salad is a simple comfort food favorite. 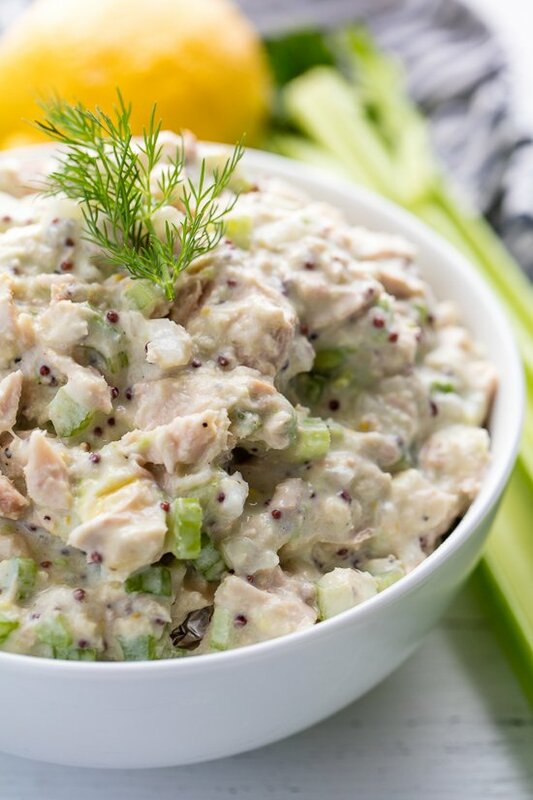 This recipe has been lightened up, for a healthy tuna salad that not only tastes great, but it’s also good for you too! Tuna salad is one of my favorite healthy lunches. In this healthy, lightened up version, I’ve stayed very traditional for a flavorful mix that’s a lot better for you than the mayo-loaded classic version. I know how much the world has loved my Tuna Stuffed Avocado, which is full of spicy goodness, and I’m pretty sure you will all love this more classic flavor profile as well. SERVING IDEAS: Tuna salad can be eaten plain, served up on a sandwich, or over toast. For low carb options, you can serve it up in a romaine lettuce leaf for a tuna salad wrap. You can slice up some cucumbers to use as chips and dip them into the tuna salad, or you can stuff the tuna salad into an avocado or tomato. What kind of tuna is best for you? There are generally two kinds of tuna that you can purchase in the canned goods section at your supermarket: Solid white albacore and skipjack/light tuna. Solid white albacore is more expensive and has a much less “fishy” taste. It has three times the amount of omega-3 fatty acids. Unfortunately, it also has three times the amount of mercury, so consumption should be limited to once per week. Is it healthy to eat tuna salad? Tuna is a great option for a healthy choice. Traditionally, tuna salad is loaded with mayonnaise which adds a lot of extra calories and fat, without any added health benefits. There are healthier replacements for mayonnaise like greek yogurt and avocado. How long can you keep tuna salad in the refrigerator? Tuna can last 3 to 5 days when stored in an airtight container in the refrigerator. Watch the video below where I walk you through every step of this recipe. You can find my full collection of video recipes over on YouTube, or browse through them right here on my website with their corresponding recipe. 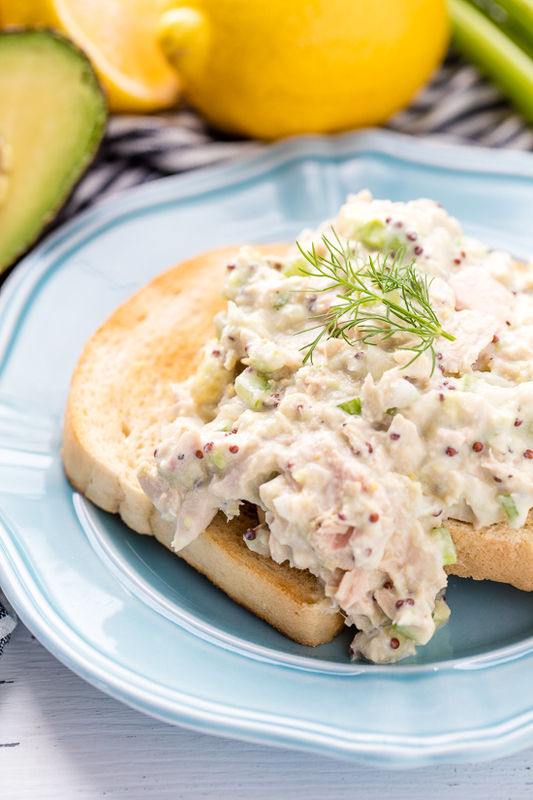 Tuna Salad is a simple comfort food favorite. 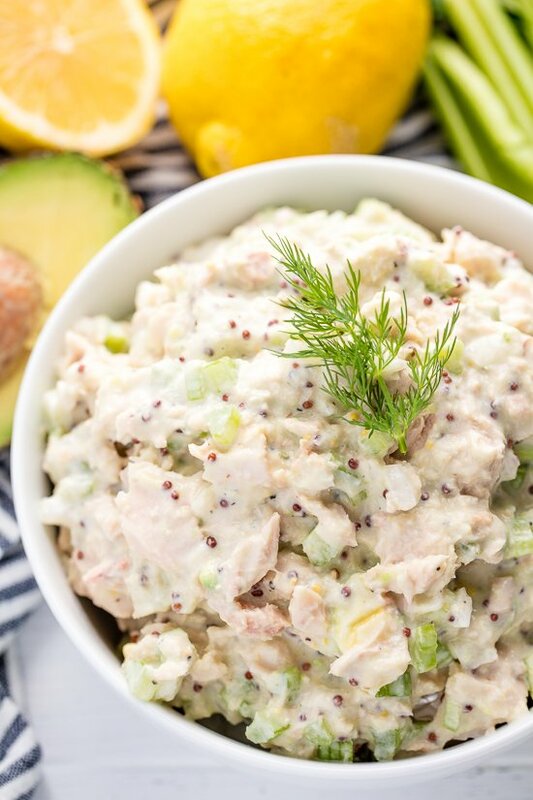 This recipe has been lightened up, for a healthy tuna salad that not only tastes great, but it's also good for you too! In a mixing bowl, stir together tuna, celery, and red onion. Gently stir in greek yogurt, avocado, lemon juice, and mustard and season with salt, pepper, and garlic powder. Stir until well combined. Serve by itself, as a sandwich, as a dip, or on toast. Be aware of side effects! This is so good, I ran through the streets naked yelling obscenities and flinging tuna at the non-believers. Thank you so much for this recipe! It got me arrested and now Big Jim is my roommate. All because of this tuna salad. Is there a good substitute for avocado? Or can it be skipped? How would it affect taste? I have never tried to make tuna salad without mayo before. I can’t use the avocado because I am allergic to it. Any suggestions? The avocado is in place of mayo since avocado is a healthy fat. This looks really delicious! Thanks for an easy and healthy recipe! PS: I think you should totally do the brownie mix taste testing. Do you have a Trader Joe’s nearby? If so, please test the truffle brownie mix they carry. While homemade is best, these are pretty darn close to perfect too. Just my humble opinion. I made this today, cutting the recipe in half. My can of Tuna was only 4 ounces, so I ended up eating the whole thing myself. I spread it on crackers and some on celery ribs.